Underneath Their Robes: Amended Opinions: A Correction from Judge Posner! Amended Opinions: A Correction from Judge Posner! Yes, dear readers, it's about that time--time for more Amended Opinions: UTR Corrections and Clarifications. Article III Groupie's latest mistake is highly regrettable, but there is a silver lining to this cloud of error: today's correction flows from further federal judicial celebrity correspondence with A3G. 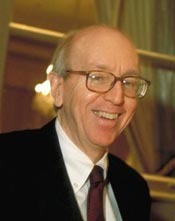 A few days ago, in this post, A3G discussed the recent visit of that Article III supernova, Judge Richard Posner of the Seventh Circuit, to the law and economics workshop at Harvard Law School. Her post relied in large part upon the reporting of her blogosphere buddy Waddling Thunder, who provided this account of the event (which came to her attention via How Appealing). This probably is not absolutely word for word what I said, because I was extemporizing, but unless I am much mistaken it is very close to what I actually said. I wish the bloggers (including you, Ms. Groupie) had checked with me before publishing the (alleged) quotation. Not that it is a matter of any consequence. Article III Groupie deeply regrets the error, and she thanks Judge Posner for bringing it to her attention. She apologizes to Judge Posner for the misquotation, and she hereby issues an official "Amended Opinions" correction (which she will append as an update to the original post). In my view, the main difference is one of context. When placed in a more complete context, Judge Posner's remarks sound much less harsh (at least to me). But I wasn't present for the talk, so I won't opine further. The issue of quotation verification--which is a standard practice within "real journalism," but much less common in the blogosphere--raises interesting questions about Journalism versus Blogging. As bloggers become more widely read and influential, should their journalistic responsibilities increase? Harvard students are making a regular practice out of misquoting the judicial branch, aren't they? Between this and the Scalia fiasco, would someone put some checks and balances on that student body? Interesting that Judge Posner wishes that bloggers had checked with him before publishing. I'm pretty reluctant to email judges about anything. I suppose if it's something about a public speech, that's different than emailing them about a recent opinion or some other topic. As WT noted, "my paper meanders a bit, but I will say that it's not plagiarized" is his paraphrase. And as such, it does not compare too unfavorably to: ""My paper meanders, but at least I wrote it myself. And while naturally I have not acknowledged my predecessors generously, neither have I made a wholesale appropriation of someone else's ideas." The essential message of sticking a finger in the collective eye of the HLS faculty seems to be largely the same.